Donald Trump speaks to retired and active law enforcement personnel at a Fraternal Order of Police lodge during a campaign stop in Statesville, North Carolina. The vote that didn’t show up in the polls, the secret groundswell of support that stunned the media establishment and the pundits and those who proudly stood with her, was not about race or gender or ethnicity. It was about blue. So far in 2016, a staggering 119 police officers have been killed in the line of duty, according to the Officer Down Memorial Page. That number includes 54 shot dead with many of those fatal blasts delivered by killers who targeted cops based on nothing other than the blue uniforms they were wearing. Five in Dallas. Three in Baton Rouge, Louisiana. Two in Des Moines. 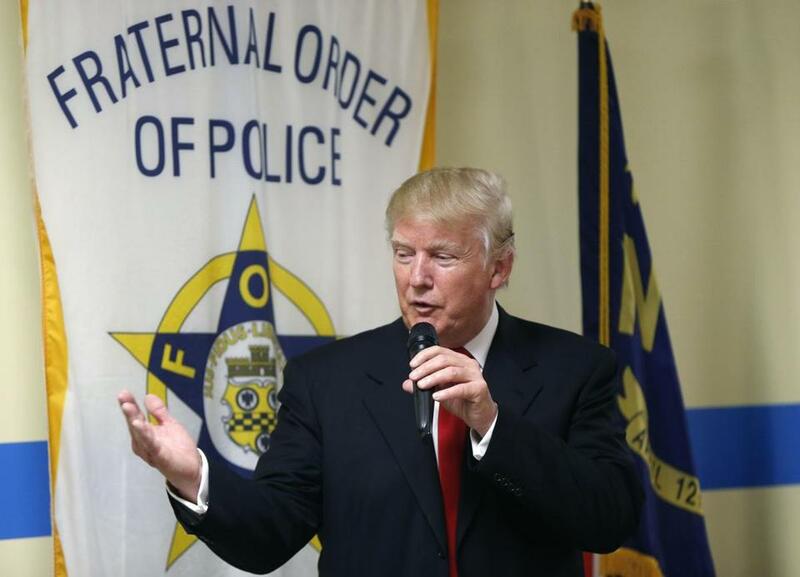 Donald Trump, love him or hate him, has been unwavering in his support of police officers. He poses for selfies with every single cop assigned to protect him. He told me in an interview that he supports capital punishment for cop killers, a statement that helped prompt the board of the New England Patrolmen’s Benevolent Association to endorse him early on, one of the first police unions to do it. Trump promised Chuck Canterbury, president of the National Fraternal Order of Police, that he would back legislation sponsored by Republican Congressman Ken Buck of Colorado called the Blue Lives Matter Act of 2016 filed in March with little fanfare. In return Canterbury delivered a significant endorsement from the FOP’s 330,000 members, an endorsement that Mitt Romney did not garner in 2012. Then came the historic endorsement from the National Border Patrol Council, the union that represents border patrol agents. A union whose 18,000 agents form what they call its green line had never endorsed a candidate for president. Shawn Moran, a border patrol agent and spokesman for the NBPC, said that Trump was the only candidate who met with its board and “promised to give us the support that has been sorely lacking.” And Moran said it wasn’t about the wall. It was about “catch and release,” which the NBPC said has become an alarming problem along the southern borders. Agents catch, but cannot hold, immigrants streaming into the country. Many who enter illegally are given the equivalent of a desk appearance ticket, make a pinky-swear promise to show up for a hearing with immigration officials, and are never seen again. For other cops, the silent majority who have watched Hillary Clinton embrace some members of the Black Lives Matter movement, law enforcement officers who were horrified when Dallas County Sheriff Lupe Valdez was interrupted with rude shouts during a moment of silence for her fallen brethren at the DNC Convention, Trump’s win was vindication for those who are doing their jobs without engaging in racial profiling or excessive force. I have long predicted that the true Trump voter is not the angry white guy. It’s the civil servants, many of them combat veterans who joined the armed forces after 9/11. They are the ones who have delivered a message to Washington elites on both sides of the aisle: Trump might be crass, but he’s going to take care of us. Michele McPhee is host of the “Michele McPhee Show’’ on 1510 WMEX Boston. Her next book, “Maximum Harm: the Tsarnaev Brothers, the FBI and the Road to the Marathon Bombings” will be released in April.